Not everybody notices you change. Most of the people, they say hey and start telling you about the bicyclist they killed on the way to work or the pistachio jelly bean they invented in their nap. It takes a special kind of person to point out your haircut. Your weight loss, your new fannypack, your sacrifice flys, your hiccups, the stains on your coat from a watermelon and peanut butter sandwich. And beyond that, it’s a rare bird who will say the soft thing about what they notice. Or will take you as you are into a noticing beyond you both. 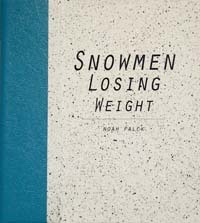 Noah Falck’s debut poetry collection, Snowmen Losing Weight, comes with puffy eyes and melancholy jokes, but its realest strength is in its pointer finger. Which is pointed not out of judgment or self-congratulation or even to cocoon two observers against the rest of the cold world (OK, well, more on that later), but to be on the lookout, most always, for a wider circle. Measuring tape that goes forever and is always restarting. Or like it says in the very first poem: “Suppose the wind falls / in love with the wrong / season.” A goal of reckless inclusion, including until we’re out of breath, toward a large and dissolving inhabitance. I don’t want to compete with a video’s description prowess, but I do want to add two things. One, there’s a real formica nostalgia to the vinyl exterior, like I’m six and trying to find everything I dropped under all the kitchen tables I’ve ever seen. Which is further confirmed by the white-and-black speckling on the cover (inverted on the endpages), which I’m going to go ahead and admit reminds me of cookies and cream ice cream. That was the second thing. The important thing: mad props to the students of Lincoln Park Performing Arts Charter School in Midland, PA, who design and produce BatCat’s books. They’ve done something beautiful and memorable. It’s an expensive book, but that’s because you’ll want to put it where everyone can see it and coo.